I first encountered Little Women when I was seven or eight; I distinctly remember opening it on a cold December day and bemoaning the fact that I had to stop reading it when our family friends came round for lunch, simply because I could not tear myself away. Whilst I so enjoyed my first encounter with the March sisters, for some reason I had not picked up the novel since. I decided to add it to my Classics Club list merely because I felt that a re-read was long overdue. I am sure that Little Women has been a part of the childhoods of many, but I will recap the main details of the story for those who have perhaps not come across it before, or are yet to read the novel. The four March sisters – Jo, Meg, Beth and Amy – all in their formative years, begin their tale by lamenting over having to forfeit their usual Christmas presents due to it being ‘a hard winter for everyone’. Their mother tells them that she thinks ‘we ought not to spend money for pleasure, when our men are suffering so in the army’. The novel is set against the backdrop of the American Civil War, which adds a relatively dark and ever-present edge to the whole. Their father – a hero of sorts – is fighting in the conflict, and it is his reference to his daughters as ‘little women’ that gives the novel its title. I found myself automatically endeared to bookish Jo and young Amy, whose initial slips in vocabulary were rather adorable. Jo is headstrong and very determined about those things which matter to her: ‘I’m not [a young lady]! And if turning up my hair makes me one, I’ll wear it in two tails till I’m twenty… I hate to think I’ve got to grow up, and be Miss March, and wear long gowns, and look as prim as a China Aster! It’s bad enough to be a girl, anyway, when I like boys’ games and work and manners! I can’t get over my disappointment in not being a boy!’ The dynamic between the sisters is so well crafted; there are squabbles and rivalries from time to time, but an overriding sense of love – even adoration for one another – cushions the whole. Alcott sets the scene immediately; in just the first few pages, we find out that the Marches are relatively poor, and the detailed jobs which the girls have had to take on to aid their mother in the running of the household and the monetary needs of the family. Her descriptions are lovely: ‘A quick, bright smile went round like a streak of sunshine’. She is very perceptive of her characters, the girls particularly; whilst they are part of the same unit, each separate protagonist is so distinctive due to the varied character traits which prevail in their personas. Meg is sensible, Jo concerned about maintaining a tough outer image, Beth kindly and sensitive, and Amy aware of what she believes is her own importance in the world. Their mother, whom they affectionately call Marmee, too, is well crafted, and the initial description which Alcott gives of her is darling: ‘a tall, motherly lady with a “can I help you” look about her which was truly delightful. She was not elegantly dressed, but a noble-looking woman, and the girls thought the gray cloak and unfashionable bonnet covered the most splendid mother in the world’. I really like the way in which Little Women begins around Christmastime; parts of it made for a wonderful and cosy festive read. The novel is incredibly well written, and the dialogue throughout has been well constructed. The conversations which the characters have – particularly those which take place between the sisters – are believable, and all daily mundanity has been left out for the mostpart. 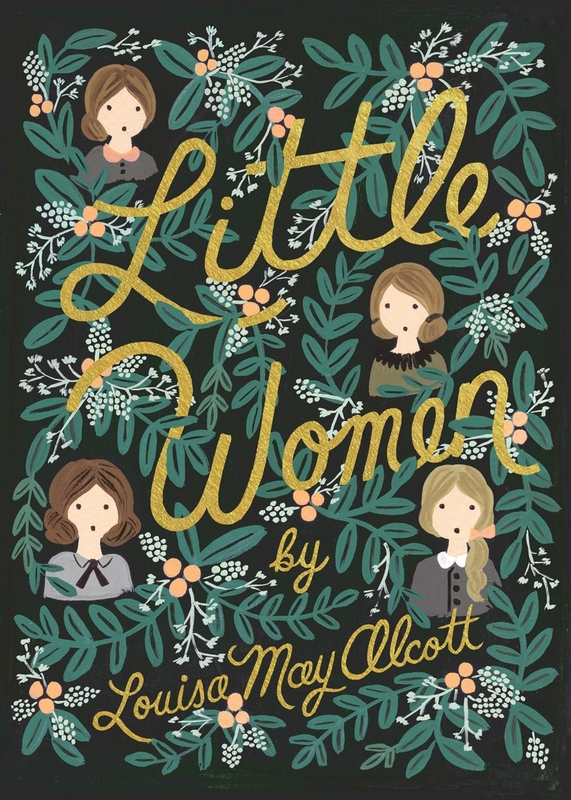 Little Women is an absolute delight to read – it is endearing, sweet, amusing and engaging, and the storyline holds interest throughout. A lot can be learnt from this novel; the girls may not have all that much by way of possessions or money, but they always make the best of their lot, and know how to appreciate everything about them. Through her characters especially, Alcott is rather wise at times. I personally preferred the girls far more when they were younger; they were still interesting constructs as adults, but they were nowhere near as endearing, and for that reason alone, the novel receives a four star rating from me. First published in October 2017. 2017 seems a fitting year in which to read The Beauty and the Beast, as Disney released its live action blockbuster just a few months ago. I did love the cartoon film as a child – my particular fondness, of course, was for the tiny chipped teacup and the glimpse of Belle’s library – but was very underwhelmed by the new interpretation. Regardless, I had never read Gabrielle-Suzanne Barbot de Villeneuve’s original story before, and made up my mind to do so, tying it in with this year’s Reading the World Challenge. The family’s youngest daughter, sixteen-year-old Beauty, is the anomaly. She has so much compassion and empathy for her family, and is a refreshing addition to a brood of rather horrid, vain girls. She in fact shows strength in the face of the family’s new-found adversity: ‘She bore her lot cheerfully, and with strength of mind much beyond her years’. When her father has to undertake a long journey in the hope of reclaiming some of his former possessions, her sisters clamour for new dresses and finery. Beauty simply asks him to bring her back a rose. Her father is subsequently caught in a snowstorm which disorientates him, and seeks shelter in an enormous, grand castle. He finds no inhabitant, but regardless, a meal is presented to him in a cosy room. He – for no explicit reason – decides that, with no sign of an owner about, the castle must now belong to him. The merchant becomes rather cocksure, and decides to kill two birds with one stone, taking a rose for his beloved younger daughter from the castle’s garden. It is at this point that he is given his comeuppance, and reprimanded by the Beast, the castle’s owner: ‘He was terribly alarmed upon perceiving at his side a horrible beast, which, with an air of fury, laid upon his neck a kind of trunk, resembling an elephant’s…’. The Beast pardons him only in exchange for one of his daughters. When the merchant describes his plight, five of his six daughters are, unsurprisingly, selfish, and believe that he should sacrifice himself for their benefit. Beauty, however, steps up to the mark, and is taken to the castle to live with the Beast. The Beauty and the Beast has been so well plotted, and has many elements of the traditional fairytale in its favour. Despite this, it goes further; its length allows de Villeneuve to really explore what could be termed magical realism. The vivid dreams which Beauty has are beautifully depicted, and tension is built at times. I found The Beauty and the Beast just as enjoyable as I would have as a child. The magic which weaves its way through the novel cannot fail to draw one under its spell; there are talking animals, enchanted mirrors, and things which appear and disappear. The talking crockery and candelabra are very much Disney additions; the novel reads as a far more fresh, and less gimmicky, version of the story. I am pleased that I chose to read the unabridged version of de Villeneuve’s story, which was published in its original French in 1740. This particular edition has been translated and adapted by Rachel Louise Lawrence, who has very much retained a lot of its antiquity. The sentence structure is quite old-fashioned – charmingly so, in fact. The writing and translation here are fluid and lovely. I would urge you, if you’ve not seen the film, to pick up this delightful tome instead. There is so much substance here, and it should definitely be placed alongside children’s classics such as The Railway Children and Mary Poppins. There is little that I enjoy better in winter than curling up with a startling Gothic novel. Below are five of my favourites. Which are your favourite Gothic novels? Are there any which you would recommend to me? I will just highlight the fact that I do not tend to read young adult books at all, but wanted to read something a little different a couple of years ago. I received a review copy of this, and enjoyed it far more than I first thought. The moral of the story is read everything, folks. My True Love Gave to Me: Twelve Winter Romances features a variety of authors who largely write solely within the Young Adult genre, from contemporary fantasy and the paranormal, to ‘the strange things that love can do to people’. Edited by Stephanie Perkins, this collection features one of her tales, along with work by Rainbow Rowell, Holly Black, Ally Carter, Gayle Forman, David Levithan, Matt de la Pena, Laini Taylor, Jenny Han, Kelly Link, Myra McEntire and Kiersten White. The blurb of My True Love Gave to Me calls it ‘a gift for teen readers and beyond’. It is ‘the perfect collection of short stories to keep you warm this winter… Each is a little gem, filled with the enchanting magic of first love and the fun festive holidays’. The inspiration within the collection is vast, and whilst all of the authors have used the festive period in their stories, they have done so in decidedly different ways. Rainbow Rowell’s tale – the lovely ‘Midnights’ – opens the book. In it, her protagonist, Mags, sits in her friend’s garden on the 31st of December and reflects upon three of her previous New Year’s Eve celebrations. Each of them revolve around her allergy-prone friend Noel, who is described as ‘her person’; the one whom she turns to in periods of strife. Rowell’s writing is sharp and her characterisation works marvellously. In Kelly Link’s interesting ‘The Lady and The Fox’, a mysterious figure in a beautifully embroidered coat befriends a young girl named Miranda during successive Christmas celebrations. In Matt de la Pena’s ‘Angels in the Snow’, a young man faces spending Christmas alone, hours away from his family. Jenny Han’s story ‘Polaris is Where You’ll Find Me’ is told from the perspective of Natalie, a Korean who was adopted by Santa, and is the only human girl to live in the North Pole. In Stephanie Perkins’ ‘It’s a Yuletide Miracle’, protagonist Marigold has gone in search of a boy who works in a Christmas tree lot near her apartment because she ‘needed his voice’ for a project; the sweetest of scenes and most sharply observed conversation ensues. The narrator of David Levithan’s ‘Your Temporary Santa’ dresses up as Santa Claus to keep the dream alive for his boyfriend’s younger sister, despite being Jewish. In Holly Black’s ‘Krampuslauf’, a New Year’s Eve celebration converges with a hearty – and clever – dose of magical realism. Whilst I have not discussed each story here, it is fair to say that there is not a weak link in the collection. Only two of the stories were not to my personal taste, but they were still interesting to read. My True Love Gave to Me is both quirky and memorable, and it provides a great introduction to a wealth of different authors writing contemporary YA. One can never quite work out where the majority of the stories are going to end, or what will occur within them; they are largely very unpredictable, and incredibly sweet. The physical book itself is lovely, with its duck egg blue and gold cover, fluorescent pink page edging and gold ribbon bookmark. My True Love Gave to Me is a great collection, in which many different viewpoints have been considered. The characters which have been created are both believable and unpredictable, and each narrative voice has been crafted with the utmost care. It is sure to make every reader – whether teenage or older – feel marvellously festive, and is a great antidote to those winter blues.